With respect to human history, timekeeping is a relatively recent human desire—probably 5000 to 6000 years old. It was most likely initiated in the Middle East and North Africa. A regular, constant or repetitive process or action to mark off equal increments of time. Early examples of such processes included movement of the sun across the sky, candles marked in increments, oil lamps with marked reservoirs, sand glasses (hourglasses), and in the Orient, small stone or metal mazes filled with incense that would burn at a certain pace. A means of keeping track of the increments of time and displaying the result. Relaying the history of time measurement has a degree of inaccuracy, much like clocks themselves. What follows is, if not completely accurate, as close as many researchers can ascertain. Time keeping has much progressed since its inception, Time Management Software now exists as a means to electronically track and measure time. The Egyptians are the first group of people that we can reasonably prove took timekeeping seriously as a culture. Many believe that the Sumerians were thousands of years ahead of the game, but proof of this is only speculative. 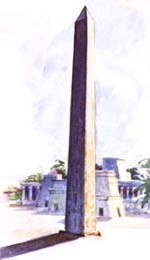 Around 3500 B.C., the Egyptians built obelisks—tall four-sided tapered monuments—and placed them in strategic locations to cast shadows from the sun. Their moving shadows formed a kind of sundial, enabling citizens to partition the day into two parts by indicating noon. They also showed the year's longest and shortest days when the shadow at noon was the shortest or longest of the year. Later, markers added around the base of the monument would indicate further time subdivisions. Around 1500 B.C., the Egyptians took the next step forward with a more accurate shadow clock or sundial. 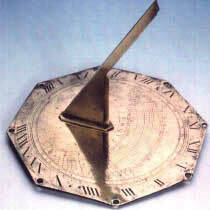 The sundial was divided into 10 parts, with two twilight hours indicated. This sundial only kept accurate time (in relative terms) for a half day. So at midday, the device had to be turned 180 degrees to measure the afternoon hours. A sundial tracks the apparent movement of the sun around the earth's celestial pole by casting a shadow (or point of light) onto a surface that is marked by hour and minute lines. That is why the shadow-casting object (the gnomon or style) must point towards the north celestial pole, which is very near Polaris, the North Star. The gnomon serves as an axis about which the sun appears to rotate. The sharper the shadow line is, the greater the accuracy. So, generally speaking, the larger the sundial the greater the accuracy, because the hour line can be divided into smaller portions of time. But if a sundial gets too large, a point of diminishing returns is reached because, due to the diffraction of light waves and the width of the sun's face, the shadow spreads out and becomes fuzzy, making the dial difficult to read. In the quest for more year-round accuracy, sundials evolved from flat horizontal or vertical plates to more elaborate forms. One version was the hemispherical dial, a bowl-shaped depression cut into a block of stone, carrying a central vertical gnomon (pointer) and scribed with sets of hour lines for different seasons. The hemicycle, thought to have been invented about 300 B.C., removed the useless half of the hemisphere to give an appearance of a half-bowl cut into the edge of a squared block. 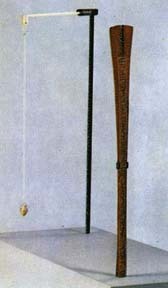 The Egyptians improved upon the sundial with a merkhet, the oldest known astronomical tool. It was developed around 600 B.C. and uses a string with a weight on the end to accurately measure a straight vertical line (much like a carpenter uses a plumb bob today). A pair of merkhets were used to establish a North-South line by lining them up with the Pole Star. This allowed for the measurement of nighttime hours as it measured when certain stars crossed a marked meridian on the sundial. By 30 B.C., there were as many as 13 different types of sundials used across Greece, Asia Minor and Italy. Clepsydras or water clocks were among the first timekeeping devices that didnt use the sun or the passage of celestial bodies to calculate time. One of the oldest was found in the tomb of ancient Egyptian King Amenhotep I, buried around 1500 B.C. 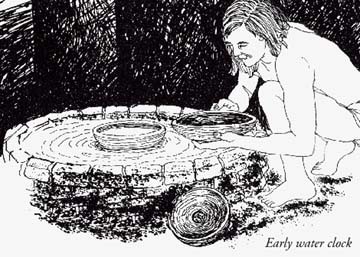 Around 325 B.C., the Greeks began using clepsydras (Greek for "water thief") by the regular dripping of water through a narrow opening and accumulating the water in a reservoir where a float carrying a pointer rose and marked the hours. A slightly different water clock released water at a regulated rate into a bowl until it sank. These clocks were common across the Middle East, and were still being used in parts of Africa during the early 20th century. They could not be relied on to tell time more closely than a fairly large fraction of an hour. A Greek astronomer, Andronikos, supervised the construction of the Tower of the Winds in Athens in the firstst century B.C. This octagonal structure showed scholars and marketplace shoppers both sundials and mechanical hour indicators. It featured a 24-hour mechanized clepsydra and indicators for the eight winds from which the tower got its name, and it displayed the seasons of the year and astrological dates and periods. In the Far East, mechanized astronomical/astrological clock-making developed from 200 to 1300 A.D. Third-century Chinese clepsydras drove various mechanisms that illustrated astronomical phenomena. One of the most elaborate clock towers was built by Su Sung and his associates in 1088 A.D. Su Sung's mechanism incorporated a water-driven escapement invented about 725 A.D. The Su Sung clock tower, over 30 feet tall, possessed a bronze power-driven armillary sphere for observations, an automatically rotating celestial globe, and five front panels with doors that permitted the viewing of mannequins which rang bells or gongs, and held tablets indicating the hour or other special times of the day. n.A mechanism consisting in general of an escape wheel and an anchor, used especially in timepieces to control movement of the wheel and to provide periodic energy impulses to a pendulum or balance. The mechanical clock was probably invented in medieval Europe. Clever arrangements of gears and wheels were devised that turned by weights attached to them. As the weights were pulled downward by the force of gravity, the wheels were forced to turn in a slow, regular manner. A pointer, properly attached to the wheels, marked the hours. Eventually, mechanical clocks were designed to strike the hour and even to chime the quarter-hour. However, they had only an hour hand and were not enclosed. Even the best such clocks would gain or lose up to half an hour a day. A technological advance came with the invention of the spring-powered clock around 1500-1510, credited to Peter Henlein of Nuremberg, Germany. 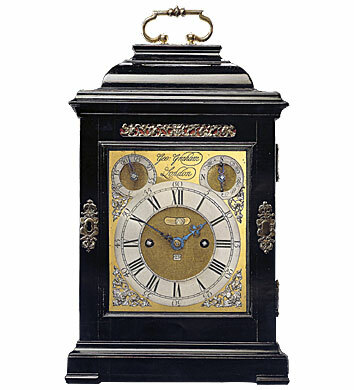 Because these clocks could fit on a mantle or shelf they became very popular among the rich. They did have some time-keeping problems, though, as the clock slowed down as the mainspring unwound. 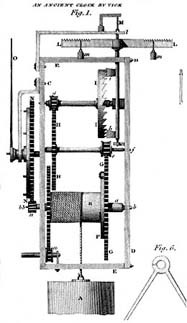 The development of the spring-powered clock was the precursor to accurate timekeeping. 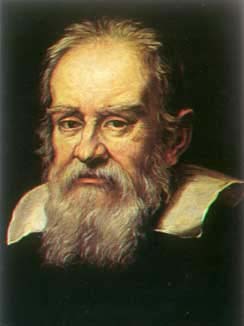 In 1582, Italian scientist Galileo, then a teenager, had noticed the swaying chandeliers in a cathedral. It seemed to him that the movement back and forth was always the same whether the swing was a large one or a small one. He timed the swaying with his pulse and then began experimented with swinging weights. He found that the "pendulum" was a way of marking off small intervals of time accurately. Once Galileo had made the discovery, the regular beat of the pendulum became the most accurate source used to regulate the movement of the wheels and gears of a clock. It wasn't a perfect system, though, as a pendulum swings through the arc of a circle, and when that is so, the time of the swing varies slightly with its size. To make the pendulum keep truly accurate time, it must be made to swing through a curve known as a "cycloid." 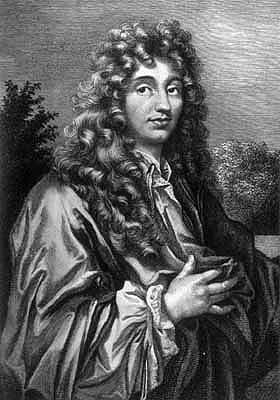 In 1656, Dutch astronomer Christian Huygens first devised a successful pendulum clock. He used short pendulums that beat several times a second, encased the works in wood, and hung the clock on the wall. It had an error of less than one minute a day. This was a huge improvement on earlier mechanical clocks, and subsequent refinements reduced the margin of error to less than 10 seconds per day. In 1670, English clockmaker William Clement made use of a pendulum about a yard long that took a full second to move back and forth, allowing greater accuracy than ever before. He encased the pendulum and weights in wood in order to diminish the effect of air currents, thus was born the "grandfather's clock." For the first time, it made sense to add a minute hand to the dial, since it was now possible to measure time to the nearest second. 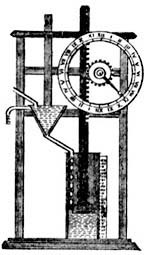 In 1721, George Graham improved the pendulum clocks accuracy to within a second a day by compensating for changes in the pendulum's length caused by temperature variations. 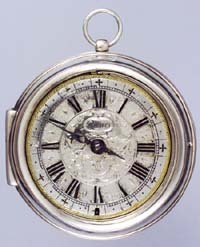 The mechanical clock continued to develop until it achieved an accuracy of a hundredth of a second a day and it became the accepted standard in most astronomical observatories. The running of a quartz clock is based on an electric property of the quartz crystal. 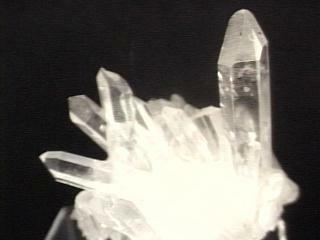 When an electric field is applied to a quartz crystal, it changes the shape of the crystal itself. If you then squeeze it or bend it, an electric field is generated. When placed in an electronic circuit, the interaction between the mechanical stress and the electrical field causes the crystal to vibrate, generating a constant electric signal which can then be used to measure time. Quartz clocks continue to dominate the market because of the accuracy and reliability of their performance and by their low cost when produced in mass quantities. but can check your heart rate, too. The internal chip could be ruined by static from your nylon shirt, nylon carpets or air-conditioned office. This problem also affected the production facility, leading to a large number of failures before the watches even left the factory. The result was that the display would freeze on one very bright digit, causing the batteries to overload (and occasionally explode). The accuracy of the quartz timing crystal was highly temperature-sensitive; the watch ran at different speeds in winter and summer. The batteries had a life of just ten days; this meant that customers often received a Black Watch with dead batteries inside. The design of the circuitry and case made them very difficult to replace. The control panels frequently malfunctioned, making it impossible to turn the display on or off, which again led to exploding batteries. The watch came in a kit which was almost impossible for hobbyists to construct. Practical Wireless magazine advised readers to use two wooden clothes pegs, two drawing pins and a piece of insulated wire to work the batteries into position. You then had to spend another four days adjusting the trimmer to ensure that the watch was running at the right speed. The casing was impossible to keep in one piece. It was made from a plastic which turned out to be unglueable, so the parts were designed to clip together—which they didn't. A very high percentage of Black Watches were returned, leading to the legend that Sinclair actually had more returned than had been manufactured. The backlog eventually reached such monstrous proportions that it still hadn't been cleared two years later. Termed NIST F-1, the cesium atomic clock at the National Institute of Science and Technology (NIST), in Boulder, Colorado is the nation's primary frequency standard that is used to define Coordinated Universal Time (known as UTC), the official world time. Because NIST F-1 shares the distinction of being the most accurate clock in the world (with a similar device in Paris), it is making UTC more accurate than ever before. 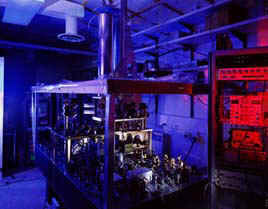 NIST F-1 recently passed the evaluation tests that demonstrated it is approximately three times more accurate than the atomic clock it replaces, NIST-7, also located at the Boulder facility. NIST-7 had been the primary atomic time standard for the United States since 1993 and was among the best time standards in the world. NIST F-1 is referred to as a fountain clock because it uses a fountain-like movement of atoms to obtain its improved reckoning of time. First, a gas of cesium atoms is introduced into the clock's vacuum chamber. 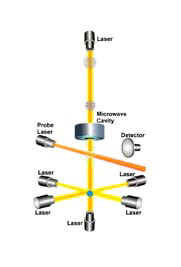 Six infrared laser beams then are directed at right angles to each other at the center of the chamber. The lasers gently push the cesium atoms together into a ball. In the process of creating this ball, the lasers slow down the movement of the atoms and cool them to near absolute zero. Two vertical lasers are used to gently toss the ball upward (the "fountain" action), and then all of the lasers are turned off. This little push is just enough to loft the ball about a meter high through a microwave-filled cavity. Under the influence of gravity, the ball then falls back down through the cavity. As the atoms interact with the microwave signaldepending on the frequency of that signaltheir atomic states may or may not be altered. The entire round trip for the ball of atoms takes about a second. At the finish point, another laser is directed at the cesium atoms. Only those whose atomic states are altered by the microwave cavity are induced to emit light (known as fluorescence). The photons (tiny packets of light) emitted in fluorescence are measured by a detector. This procedure is repeated many times while the microwave energy in the cavity is tuned to different frequencies. Eventually, a microwave frequency is achieved that alters the states of most of the cesium atoms and maximizes their fluorescence. This frequency is the natural resonance frequency for the cesium atomthe characteristic that defines the second and, in turn, makes ultra precise timekeeping possible. The "Natural frequency" recognized currently as the measurement of time used by all scientists, defines the period of one second as exactly 9,192,631,770 oscillations or 9,192,631,770 cycles of the Cesium Atom's Resonant Frequency. The cesium-clock at NIST is so accurate that it will neither gain nor lose a second in 20 million years! This new standard is more accurate by a wide margin than any other clock in the United States and assures the nation's industry, science and business sectors continued access to the extremely accurate timekeeping necessary for modern technology-based operations. A soft, silvery-white ductile metal, liquid at room temperature, the most electropositive and alkaline of the elements, used in photoelectric cells and to catalyze hydrogenation of some organic compounds. Atomic number 55; atomic weight 132.905; melting point 28.5°C; boiling point 690°C; specific gravity 1.87; valence 1. Cesium was discovered by spectroscopy in 1860 by Robert Bunsen and Gustav Kirchhoff. 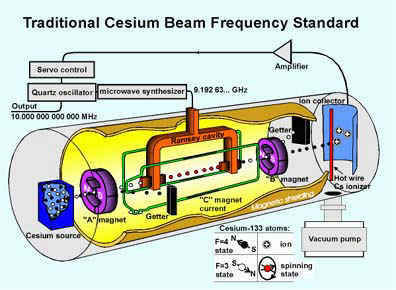 One gram of cesium is an ample supply for a typical atomic clock to run for one year. A gram of cesium could be found in about a cubic foot of ordinary granite. Natural cesium is pure cesium-133 (55 protons and 78 neutrons in the nucleus, 55+78=133): it is non-radioactive.